Like New Gorgeous Mountain Cabin! 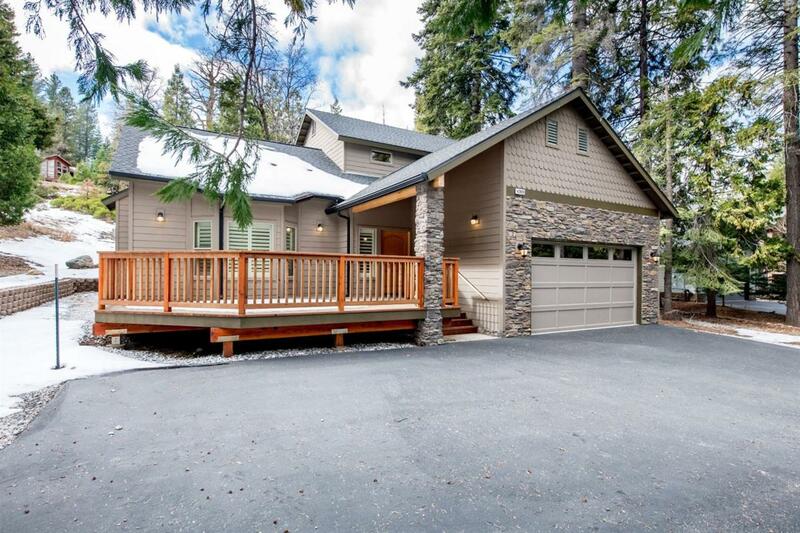 Private wooded setting on a half acre lot in Granite Ridge. Pretty back yard with lots of granite outcroppings and pines. Massive great room with high vaulted ceilings, wood floors, floor to ceiling rock gas fireplace with log mantel and plenty of windows to view the forest. Pretty kithen with granite counter tops, stainless steel appliances & Knotty Alder custom cabinetry. Large master suite on main level has private access to back patio, nice walk-in closet & spacious tile shower. Upstairs are two nice guest bedrooms, full bath & small sitting loft perfect for overflow or small office. Granite Ridge is a beautiful mountain community located at approx 6000 foot elevation so enjoy plenty of winter snow and cool summers. Just 5 minutes to Shaver Lake's Village, 10 minutes to the Lake and 35 minutes to ski China Peak! Awesome family cabin!